You are here: Home » I’m Home…Sweet Lady Whiskey. Jim and I just got back from GABF on Sunday. My liver was pickled and I had no cravings for booze of any kind Sunday afternoon or evening. Then Monday morning I started to get a craving that I really couldn’t put my finger on. I thought about it, and I ran throught all the beer styles I had in the house and decided it wasn’t any of them. Then I remembered…Oh yeah, I’m the Whiskey Brother! That’s what I want a good stiff glass of whiskey. So last night while we watched the 49ers and Saints game… Ahhh…it was just what the doctor ordered, an big three finger pour of Woodford Reserve to kill off the 350ml bottle. I sipped on it all night and each time I did I was glad to be drinking whiskey, but also picked up on a new flavor this time that I have never tasted from Woodford’s before. About mid palate there was a very distinctive yeast quality to the drink. I don’t know if my taste buds were heightened by all the diverse alcohol flavors I had tasted over the previous two days, or if perhaps just having a whiskey again my tasters were tasting better, but there it was. It wasn’t off putting, but it was much larger than I had ever tasted or remembered. While out Friday night at GABF Jim and I stopped into the hotel bar and managed to order a shot of Strahan’s Colorado Whiskey. When I buy my next bottle I will get some and review it, but it was quite good and bodes very well for the micro distillery revolution that is upon us. So there it is…too much beer, I needed a Whiskey…ahhh sweet lady whiskey. ← Can You Get Craft Beer Overload? I had the same experience last night. Spent most of the early evening trying to sort out if I was going to open a bottle of wine but then realized I was craving a whiskey. Three (give or take..probably give) fingers of Dalmore 12 did the trick…. It’s good, and just so darn convenient. See you can put a cork or screw a lid back on a whiskey bottle and it can sit there for 10 years until you want it again. Wine is a commitment! LOL, like any bottle of anything lasts 10 years once opened. I give an open bottle a max shelf life of 1 yr in a personal bar, and depending on the spirit, 10 days to 3 months. 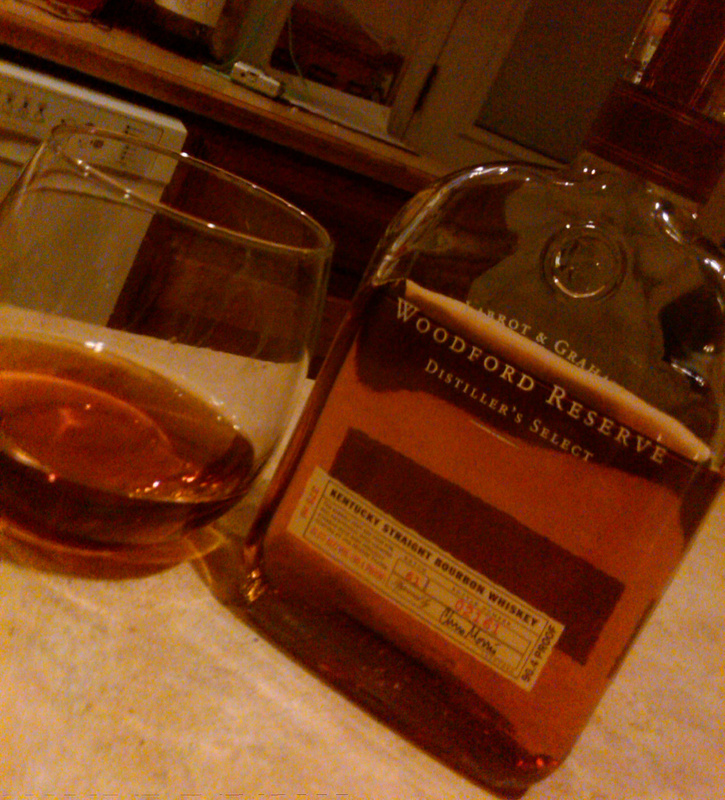 I do love that Woodford Reserve… Good stuff..
Well….I guess it was more theoretical than an actual situation. You know, I’m kinda giving up a little on the Woodford Reserve. I’m not too impressed with it from a flavor standpoint and there are a lot of other whiskeys I would buy before I spent $35 on a fifth of Woodford. But that is just me, I know a lot of people like it a lot. I’m craving a little Kentucky Spirit myself. Whiskey is great change up after all of that beer. I know I enjoyed it a lot. I thought it was strange, however that after all the beer we sampled on Friday that when we sniffed the Strahan’s Colorado Whiskey that it actually smelled like beer, or at least barrel aging, and our brains just said beer at that point. I’m looking forward to trying it again to see if it still smells that way or if it changes once the preconditioning wears off. I just found your blog a few weeks ago, and I’m enjoying it so far. I was wondering if you tried the new Woodford Reserve Maple Wood (from the experimental Masters Collection). I read reviews that were mixed, but I trust your down to earth discussions and would love your opinion. I really like a fine whiskey or bourbon, but I can’t bring myself to drop $90 for a bottle of something new that’s getting mixed reviews. Your thoughts? I haven’t tried it yet. Don’t have it in the state that I know of. But it sounds interesting. That said I could think of a lot of great whiskeys that I know will be great at that price point. For example George Stagg from the Buffalo Trace Antique Collection is a masterful whiskey. It actually got either a 99 or a 100 from Malt Advocate. It runs about $90 a bottle and you wouldn’t have to “hope” you liked it. That said, I do truly like the Makers 46 which uses french oak staves on regular makers to make a flavorful whiskey that is still plenty hot like Makers is known for. So, if you are curious give it a try. $90 won’t kill you. But if you are more pragmatic, I say look around a little you might find something you like better for less coin.